So I thought to myself recently. Who is Satoshi Nakamoto? The original genius behind Bitcoin back in 2009. More so, I thought…What is he doing now? After some research I was able to potentially link the creator of Bitcoin to a website, specifically directory.io. These thoughts and questions led me to the Bitcoin Core source Github. This is where the cryptocurrency started and this is supposedly the first publicly recorded place of the source of Bitcoin. I decided to take a look at the very first commit of Bitcoin on August 29th of 2009 when it all started. Looking at the user that committed, in theory should be Satoshi Nakamoto himself. Hmm.. But technically, this is the source everyone is now using and has been since 2009, so I am naturally more curious of this user that actually committed it. saracen…Looking further into this users Github account, I noticed that they have several Bitcoin related repositories and a lot of private repositories. One of the repositories that really stuck out at me through doing this research was: Directory.io (Github Source)…Now this just makes you wonder doesn’t it?. . .
Directory.io is a site which lists a directory or Bitcoin private keys associated with a public address. The private keys are generated based on the page number that you request. Essentially if you request the correct page number e.g. http://directory.io/628374362874 you could potentially discover some private keys which contain Bitcoins on them. However, the chance of that is happening is close to zero. The website is a sort of joke since it was posted to the bitcoin developer mail list as “All bitcoin private keys have been leaked”. Furthermore, when you go to the homepage it says “It took a lot of computing power to generate this database”. 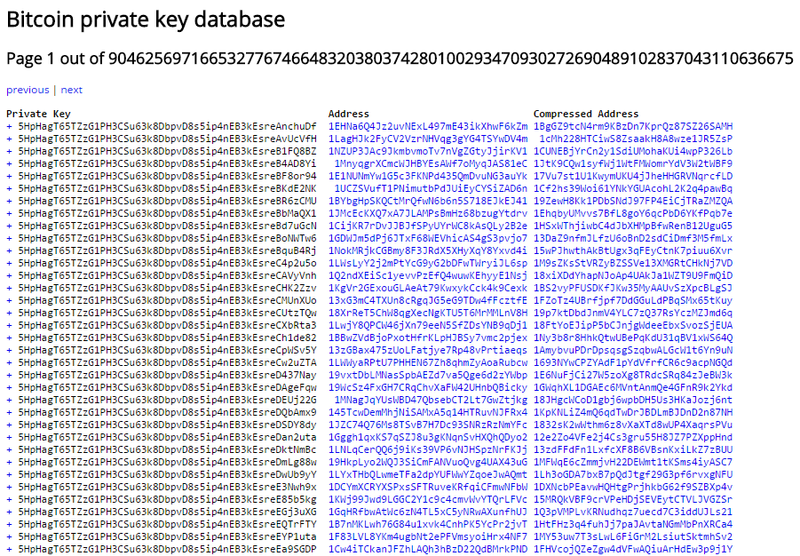 In reality, the keys are generated on the fly depending on what page number you request. Since the domain is a .io one, the owner’s public information is openly available. Looking at the whois info give us the following name: Arran Walker. Without pointing fingers, as the first person to commit to the Bitcoin repository Arran could have very close ties with Satoshi himself. Carsen is a 25 year old developer and designer. He was introduced to Bitcoin in 2009 when it was started. He has been involved in the cryptocurrency industry since early 2013. His work is currently focused on game development and random crypto projects.